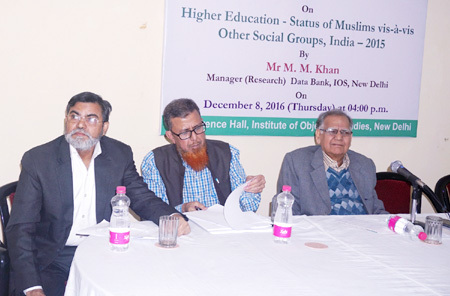 A lecture on “Higher Education - Status of Muslims vis-a-vis Other Social Groups, in India – 2015” was organised by the Institute of Objective Studies here on December 8, 2016. Speaking on the subject, manager (research) data bank, Institute of Objective Studies, Md. 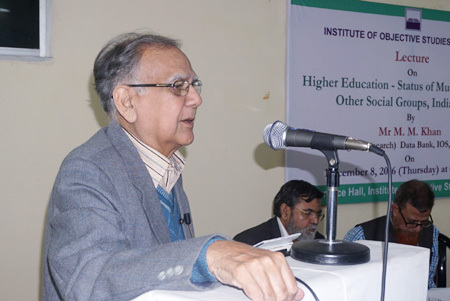 Mutawassim Khan, held that the percentage of Muslims pursuing higher education was lowest compared to Hindus and Christians who accounted for 20 and 13 percent respectively. According to the draft report prepared by the Union ministry of human resource development, only 11 percent Muslims took up higher education. He said that the figures of other communities were above the national average of 18.8 percent. He noted that the draft report was based on the National Sample Survey (2009-10) data. The low percentage among Muslims could be attributed to various socio-economic reasons. He observed that the situation was worse in rural areas as only 6.7 percent Muslims took up higher education. Mr. Khan pointed out that the low enrolment among Muslims had prompted the national planning commission to propose a new scheme to open colleges in the areas dominated by Muslims in the next five years. In higher education among Muslims, their enrolment was worse than the scheduled castes and Scheduled Tribes. According to All India higher Education 2014-15, compared to ST enrolment of 4.77 percent, Muslim enrolment stood at 4.45 percent. He called for channelisation of financial resources of the well-off in the Muslim community and the Muslim leaders to give a helping hand to needy students. Mr. Khan remarked that India’s higher education system was the third largest in the world, next to those of the United States and China. The main governing body at the tertiary level was the University Grants Commission which enforced its standards, advised the government and coordinated between the Centre and the states. He said that the major area of concern before the country was the creation of employable workforce to harness demographic dividend. Thus there was an immediate need for a holistic and symbiotic association between industry and the academia to produce employable graduates. Mr. Khan said that the number of universities in the country kept from 25 in 1947 to 348 in 2005. Similarly, enrolment rose from 0.1 million in 1947 to 10.5 million in 2005. Today, higher educational institutions had an enrolment of 10.5 million students with about 2.5 million enrolments every year. He added that approximately 45 percent students pursued degree courses in arts, 20 percent in science and 18 percent in commerce. The remaining 17 percent enrolled themselves in professional courses like law and medicine. Understanding the importance of education for all (EFA), he said that it was important for global change in society. EFA was a global movement led by the UNESCO for meeting the learning needs of all children, youth and adults. He explains that a fast track initiative was set up to implement EFA for accelerating progress towards quality in universal primary education. 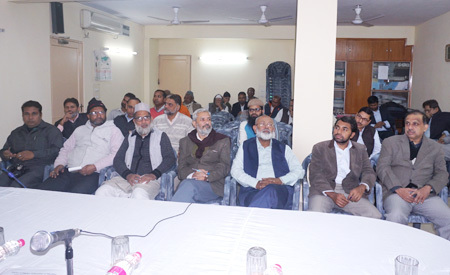 Calling for a change in mindset, he said that Muslim approach should be akin to that of other communities like Sikhs and Christians who had a sense of belonging to their community at the macro level. 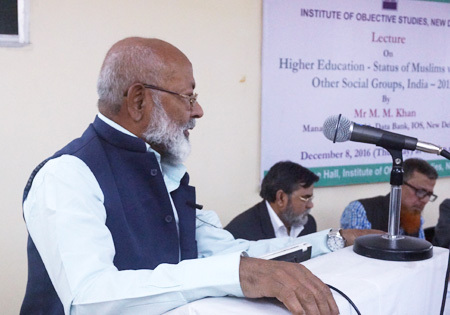 Chairman, IOS, Dr. M. Manzoor Alam asked the younger generation to forge ahead and not allow themselves to be lax in the struggle for securing rights due to them from the government as those rights were guaranteed to them by the Indian Constitution. Emphasizing the need for the motivation of the youth, he said that education must work as a catalyst for change. The stranglehold of illiteracy should be broken to ensure the welfare of the community. Calling for better coordination among community organisations, he said that the exchange of information was vital for understanding the problems coming in the way of education. He urged community leaders to acquaint themselves with various schemes being implemented by the government for Muslims and regularly monitor their progress. Secretary (education) of the Jamat-e-Islami, Maulana Inam Ullah Falahi attributed educational backwardness of Muslims to their economic plight. He appealed to Muslim organisations to ensure that Muslim students did not drop out. In his presidential remarks, the secretary general, IOS, Prof. ZM Khan held that the data were very important as they gave a glimpse of the progress of a community in different fields, including education. Commenting on the statistics presented by MM Khan, he said that the community must feel it was lagging behind in education. But, on the other hand, Muslims living in urban areas, wanted to give good education to their wards. However, quality education was still a far cry as it was costly. But education was essential for lifting the community. Referring to efforts of IOS to work on the uplift of Muslims and other marginalised sections, he said that it was affirmative action that could bring about a positive change. Highlighting the contribution of the institute in the areas of research, reference and data collection, he said that 40 percent figures contained in the Sachar Committee Report were accessed from the IOS data bank. The lecture was preceded by the recitation of a verse from the holy Quran by Hafiz Athar Husain Nadwi with its translation in Urdu. 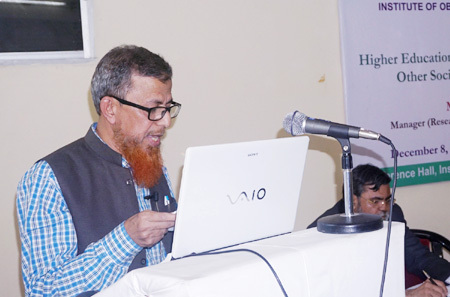 In-charge of the Arabic section, IOS, Dr Nakhat Husain Nadwi conducted the proceedings. Among others, the lecture was attended by Pervez Ashrafi, Abdur Rashid Agwan, S. Haja, Dr. Aftab Alam, Dr. Syed Shakeeb Arsalan, Khalid Md. Tabish, Niyaz Ahmad, Dr. Aghaz Tarannum, Md. Qaiser Ahsan, Wasim Ahmed, Safi Akhtar, Iqbal Husain and Maulana Khalid Husain Nadwi.